The Dariali Gorge (Georgian: დარიალის ხეობა, Darialis Kheoba; Russian: Дарьяльское ущелье; Ossetian: Арвыком, Arvykom) is the gorge on the border between Russia and Georgia. It is at the east base of Mount Kazbek, pierced by the river Terek for a distance of 8 miles between vertical walls of rock (1800 m/5900 ft) and is located south of present-day Vladikavkaz. The name Darial originates from Dar-e Alān (در الان) meaning Gate of the Alans in Persian. The Alans held the lands north of the pass in the first centuries AD. It has been fortified in ancient times by the Romans and Persians; the fortification was variously known as the Iberian Gates[lower-alpha 1] or the Caucasian Gates. The pass is mentioned in the Georgian annals under the names of Darialani; Strabo calls it Porta Caucasica and Porta Cumana; Ptolemy, Fortes Sarmatica; it was sometimes known as Porta Caucasica and Portae Caspiae (a name bestowed also on the "gate" or pass beside the Caspian Sea at Derbent); and the Tatars call it Darioly. Josephus wrote that Alexander the Great built iron gates at an unspecified pass which some Latin and Greek authors identified with Darial. Darial Pass fell into Sassanid hands in 252-253, when the Sassanid Empire conquered and annexed Iberia. The control of the Darial Pass switched to the Western Turkic Kaganate in 628, when Tong Yabgu Kagan signed a treaty with Iberia, transferring over to the Kaganate the control of all its cities and fortresses, and establishing free trade. Control of Darial Pass switched to the Arab Rashidun Caliphate in 644. Afterwards, it was controlled by the Kingdom of Georgia. There was a battle point between the Ilkhanate and the Golden Horde, then indirectly controlled by Safavids and Qajar state, until it was captured by Russian Empire after annexation of Kingdom of Georgia in 1801-1830. It remained a strategic Russian forepost under Russian control until the dismemberment of the Soviet Union. The Darial Pass was historically important as one of only two crossing of the Caucasus mountain range, the other being the Derbent Pass, and has been long fortified — at least since 150 BC. Ruins of an ancient fortress are still visible. 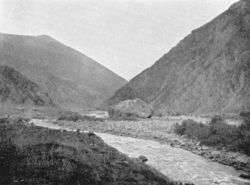 The pass served as a hub point for many roads connecting North and South Caucasus and remained open for traffic for most of its existence. The Russian fort, Darial, which guarded this section of the Georgian Military Road, was built at the northern end of the gorge, at an altitude of 1447 m (4746 ft). Wikimedia Commons has media related to Darial Gorge. 1 2 3 One or more of the preceding sentences incorporates text from a publication now in the public domain: Chisholm, Hugh, ed. (1911). "Darial". Encyclopædia Britannica. 7 (11th ed.). Cambridge University Press. p. 832. 1 2 Van Donzel & Schmidt 2010, pp. 51–52. ↑ Van Donzel, Emeri; Andrea Schmidt (2010). Gog and Magog in Early Syriac and Islamic Sources: Sallam's Quest for Alexander's Wall. Brill Academic Publishers. p. 11. ISBN 978-9004174160. ↑ Reynolds, Gabriel Said (2007). The Qur'an in its Historical Context. Routledge. p. 186. ISBN 978-0415428996. Van Donzel, Emeri J.; Schmidt, Andrea Barbara (2010). Gog and Magog in Early Eastern Christian and Islamic Sources: Sallam's Quest for Alexander's Wall. Brill. ISBN 9004174168.